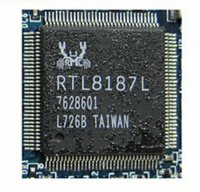 Realtek RTL8187L, IEEE 802.11a/b/g Wireless LAN Network Interface Controller with USB 2.0 Interface. hello I have rtl8187B wirless 802.11g doesnt appear to be finding any networks in range on my gateway laptop,, However other gateways and ibm thinkpad gets on my net work fine…. I went to device driver… and it shows its enabled.. I eveen did update drivers,, says its the latest version..
My e-mail address is wd0dyg@hotmail.com. However, I’m a very busy person and I hardly ever get a chance to check my e-mail. Also, I have to go out of my way to get to the internet sometimes. Telephones are everywhere but not the internet. If you can send me an e-mail, please also call my cell-phone number to inform me that an e-mail response awaits me. That way I won’t miss this important e-mail that is all nested in with piles of junk e-mail all around it. I don’t want to overlook or miss your important e-mail. You can alert me by calling me at (701)-220-0820. Thanks. I’ve got a WLAN USB adapter antenna that brings wireless internet to computers that might not otherwise be able to receive an available wireless internet signal. The unit is black in color and housed in a plastic casing / shell. “Realtek” is the name of the unit or it is the name of the program that supports the unit. I got the unit from a friend who bought it off the internet. The unit came with a CD disc to download the wireless internet program into the computer. Amongst other things, it displays signal strength on the screen and available wireless internet signals to choose from in my reception area. The antenna unit includes two parts : 1. a small device shjaped like a jump drive / flash drive – computer memory device that probably has some miniature circuit board inside. On one end is a USB attachment and on the other end is a screw on antenna connector. 2. The antenna screws on at that point. The antenna then has a hinge in it that allows the antenna to go from straight out (180 degrees) to being bent up upward to 90 degrees. (Also it could be said that the antenna can go from the 3’oclock position to the 12 o’clock position.) This flexiblity of the antenna is for : A. convenience of fitting the computer and antenna on a short desk top or other cramped table top area B. Optimum positioning of the antenna for optimum reception of the wireless signal incase there is minimal or poor reception of the signal. This unit worked fine for many moons / monthes. All of a sudden it would not work. The wireless internet program is still on my computer for the use of the antenna. When the program or the antenna unit seemed to stop working I would then try my computer at other areas where a wireless internet signal was available. It made no difference even though a signal was available. I might first ask my friend for the CD program which I returned to him so I can reinstall the program on my computer incase the program became corrupted in some manner that I’m unaware of. Also, if that makes no difference, then atleast I’ll be more aware that the problem that remains might be some sort of problem with the antenna unit. I’ll also try the antenna unit on his computer. I will try trouble shooting it in this manner to become more aware of what might be causing the problem. I’ll have to wait to get ahold of this guy since he is hard to get ahold of. In the mean time I thought someone else might have had the same problem with the same antenna unit or program and discovered what caused the problem. If they discovered what the problem was, maybe they will know what the solution is as well. I need driver RTL 8187L wireless usb network adapter for windows 7 64 bits,but I can’t download. ven и dev не знаю модуль на работе под рукою нет!